Organize your storage space with Edsal's heavy-duty steel shelving. Durable textured industrial black finish makes this unit perfect for the garage, basement, warehouse or office. Five coated wood grain particleboard shelves support loads and provide an easy to clean surface. Weight capacity up to 4,000 pounds distributed evenly over the entire unit. Shelves adjust every 1-1/2 inches. Metal post couplers are included for fast and easy assembly and improved rigidity. Shelving unit assembles in minutes with just a hammer, no nuts or bolts required. Build as a shelving unit or horizontal as a workbench. Create visible, accessible storage space instantly with Honey-Can-Do 4-Shelf Steel Commercial Shelving Unit. A black powder-coated finish and 54-inch steel frame make the unit a perfect blend of style and functionality. Durable enough for the mudroom, garage or commercial kitchen, the shelving is capable of withstanding an impressive 250 lbs. per shelf of evenly distributed weight and is NSF-rated for food equipment spaces including refrigerators, freezers and ware washing areas. Adjustable shelves and stackable components allow you to change the configuration as your storage needs evolve, and you can also combine multiple units (each sold separately) to create a customized storage wall. Gain visible, accessible storage space instantly with the Honey-Can-Do Steel Shelving Unit. Durable enough for the garage, workshop or commercial business use, the shelves can each hold an amazing 800 pounds of evenly distributed weight. This industrial-quality unit is made of sturdy, powder-coated black steel and is rust resistant, making it a great choice for any environment. 5 adjustable shelves allow you to customize your configuration and change it as your storage needs evolve. Combine multiple units to create a customized storage wall. 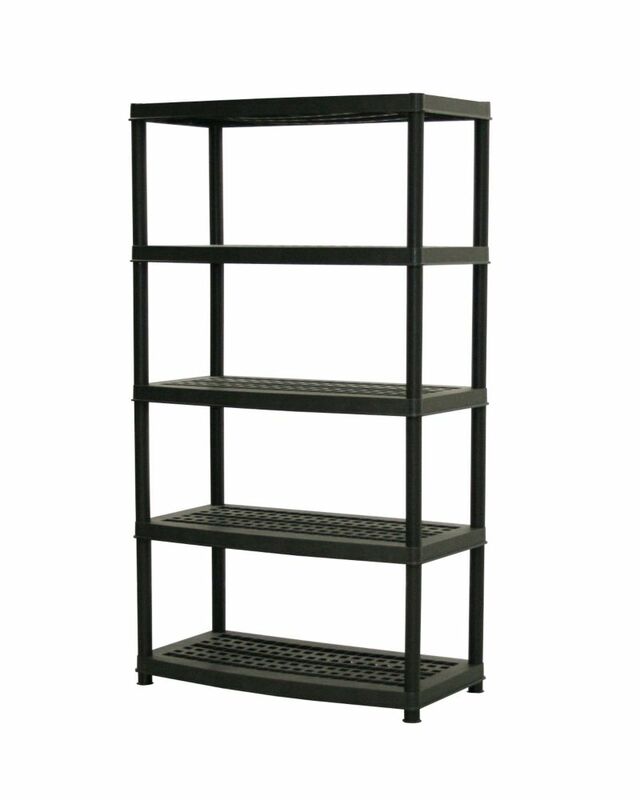 72-inch x 36-inch x 18-inch 5-Tier Shelf in Black The 5-tier shelving unit is 72 inch. H x 36 inch. W x 18 inch. D. Use this multi-purpose storage organizer in your home, garage, basement or utility area to keep your space neat and manageable. It is designed to hold most storage tote sizes, providing you with options for every room. 72-inch x 36-inch x 18-inch 5-Tier Shelf in Black is rated 4.4 out of 5 by 14. Rated 5 out of 5 by Lisa39 from Perfect size Rather than installing shelving to the walls in closets we put these shelving units right into the closets. One we use as a pantry. Freed up so much space in kitchen. We split other ones and put in bedroom closets. Others are in garage and basement. Great price. Rated 5 out of 5 by Naz305 from Great product Process to order on line and pick in store was very easy. Easy to assemble, product was as described, not fully loaded the shelves so i can't say if it will handle the stated load in the description. Good for what i need. Rated 4 out of 5 by Mo Jo from Nice product Light and easy to assemble . Just what I needed for some basement storage . Rated 5 out of 5 by CFBL from Storage Shelves I bought these for my husbands garage and we are both really pleased with how much they hold, how sturdy they are and how visual everything is. Rated 5 out of 5 by VeeCee from Sturdy This product is great. Very easy to put together. Looks great and is quite sturdy. Extremely satisfied. Rated 5 out of 5 by Jack from Great Shelf Very sturdy shelf for the cost. Would purchase again! What is the height of one shelf? Possible to assemble this without the top shelf so I could put something taller on top and have not be so high or does the entire thing need to be assembled for stability? Can you skip a shelf to make a taller shelf area? Or do you have to use all 5? Have to use all five. Are the shelves at a &quot;fixed height&quot; of are they adjustable?